Amadeal's hugely successful CJ18A mini lathe. 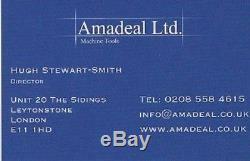 The Amadeal CJ18A 7x14 Mini-lathe - Top Spec - Lowest Price. Now fitted with carriage lock. 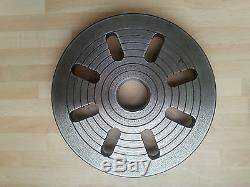 100mm (4) CHUCK FITTED AS STANDARD - 100mm SPINDLE PLATE - NO ADAPTER PLATE NEEDED. A GENUINE BARGAIN PRICE With 4inch Spindle Plate as standard with 4inch (100mm) 3-jaw self-centering Chuck. 350mm Between Centres 550W Motor Digital Readout of the spindle speed Tailstock lever lock. 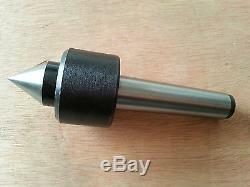 I have a range of accessories to go with this lathe at discount prices. With this lathe you will get a superb workhorse, a guarantee and a full after sales service. Can be viewed and collected from my east London premises. Swing Over Cross Slide: 110mm. Spindle Speed: 50 - 2500rpm. Chuck diameter 100mm (Integral spindle plate is 100mm and can take 3 or 4 jaw chucks - no adapter plate required). Range of Metric Threads: 0.5 - 2.5mm. Range of Imperial Threads: 12 - 52 TPI. Size with packaging is L: 81cm W: 30.5cm H: 31.5cm. Actual dimensions of lathe - 77 x 32 x 29cm. Includes dead centre, set of external jaws, tray, rear splash guard, set of hex keys,ner, oil can. 240V (plugs into UK domestic ring main). Should be treated as a guide as there can sometimes be a small variance from the quoted details. Carriage is free to most of UK mainland (but excludes Northern Ireland, Islands & several Scottish postcode areas). Contact me beforehand for a quotation. The above applies to mainland UK, excluding NI - We use leading UK couriers and on rare occasions there can be a delay. The item "Mini Lathe Brand New 7x14 Machine with DRO & 4 Chuck with Multiple Options" is in sale since Thursday, February 15, 2018. This item is in the category "Business, Office & Industrial\Metalworking/Milling/Welding\Lathes". The seller is "harryuk123" and is located in London.